Implant Supported Dentures Springfield Missouri MO. Are you a current user of traditional dentures, but interested in a more convenient and comfortable alternative to tooth replacement and smile enhancement? Traditional dentures can sometimes cause gum irritation, require time-consuming maintenance, and move, slip, or even fall out of your mouth. If you have full or partial dentures, our experienced cosmetic dentists, Dr. Grant Olson and Dr. Megan, can anchor your dentures to alleviate many of the problems you are experiencing. Implant supported dentures, also known as anchored dentures, basically affix your dentures to the jawbone, allowing for a more comfortable and strong fit. After this procedure, your dentures can look and feel more like a natural, permanent part of your mouth. If you are interested in learning more about implant supported dentures, or if you would like to schedule a consultation, please contact Innovative Dental today. During your first appointment, Dr. Olson or Dr. Megan will assess your jawbone density and overall oral health, utilizing our advanced 3D X-Ray technology. All candidates for implant supported dentures need to have strong, adequate jawbone density in order to successfully anchor the dental implants. 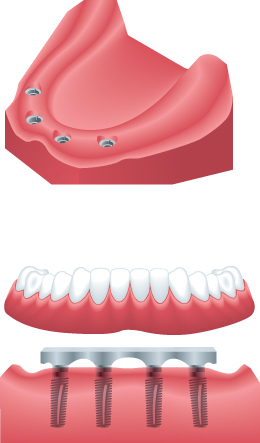 Once it is determined to move forward with treatment, we will create a mold of your mouth to assist us in creating a unique, custom prosthesis. Titanium posts are then surgically placed into the gum tissue to simulate a tooth “root,” which, over the next few months, should completely fuse to the jawbone and ultimately serve as a permanent, stable support for the denture. We use advanced technology from Nobel Biocare to provide rapid fusion between the implant and the jawbone for quicker restorative results and exemplary stability. With implant supported dentures, you can expect to have new teeth that look and function much like your natural teeth. You can also clean and maintain your teeth the same way in which you maintain your natural teeth through regular brushing, flossing, and routine check-ups with your dentist. If you have any questions about implant supported dentures, or if you are interested in scheduling a comprehensive consultation with Dr. Olson or Dr. Megan, please contact us.